The protein and molecular characteristics of variants of the α1-antitrypsin (AAT) gene are described, and available data on the genetic epidemiology of AAT deficiency are presented. In the last 40 years, following the publication of the seminal paper by Laurell and Eriksson,1 there have been significant advances in the understanding of genetic abnormalities related to α1-antitrypsin (AAT) deficiency and of the pathophysiology of the associated lung and liver diseases. During the same period, data from a number of genetic epidemiology surveys have been accumulated. As a result, we now have a fairly comprehensive picture of the distribution of AAT deficiency, especially in developed countries, and some soundly based hypotheses about AAT gene evolution, the origin of AAT deficiency, and its spread. This paper reviews the available data on the genetic epidemiology of AAT deficiency. A preliminary discussion on the protein and molecular characteristics of AAT variants provide a background to facilitate a better understanding of the nomenclature and epidemiology data discussed. α1-antitrypsin (AAT or α1-AT, also referred to as α1-proteinase (or protease) inhibitor (α1-PI)) is a 52 kD glycoprotein mostly secreted by hepatocytes and, to a lesser extent, by lung epithelial cells and phagocytes. It inhibits a variety of serine proteinases but its preferred target is human neutrophil elastase (HNE), for which it demonstrates the highest association rate constant.2 The major function of AAT in the lungs is to protect the connective tissue from HNE released from triggered neutrophils, as supported by the development of pulmonary emphysema early in life in subjects affected by severe inherited deficiency of AAT.3 In the majority of humans the lungs are defended from HNE attack by normal AAT plasma levels ranging from 100 to 200 mg/dl (as measured by nephelometry). Although AAT is a well known acute phase reactant, this wide variability in its normal plasma levels mostly reflects the marked pleomorphism of the glycoprotein. More than 100 genetic variants of AAT have been identified and these are strictly associated with specific AAT plasma levels in a co-dominantly inherited fashion4,5—in other words, plasma AAT levels are determined by both AAT gene alleles independently of each other. Normal, characterised by AAT plasma levels within general population reference ranges, not associated with a risk of lung or liver disease. This category includes the four most common middle migrating M variants (M1→M4) and a number of less common variants identified on the basis of the alphabet letter, as indicated above, and the city of the oldest living carrier of the variant8—for example, Lfrankfurt. Deficient, characterised by reduced but detectable AAT plasma levels, associated with an increased risk of developing lung or liver disease. This category includes the most frequent deficient variants, Z and S, and a number of less frequent variants including the so called M-like variants (Mmalton, Mprocida, etc), with a middle migrating pattern. The upper limit of the plasma AAT level to include an AAT variant in this category is 80 mg/dl—that is, that displayed by most subjects with the PI*SZ genotype. Null (currently designated QO), with no detectable plasma AAT level, associated with an increased risk of developing emphysema. Knowledge of the molecular structure of the AAT gene began to emerge roughly two decades after the report of the serum protein deficiency.9 The AAT gene is part of a gene cluster, located on human chromosome 14q32.1, called the SERPIN (SERine Proteinase INhibitor) supergene. This gene cluster includes the corticosteroid binding globulin (CBG), AAT-like pseudogene (PIL), AAT, protein C inhibitor (PCI), and α1-antichymotrypsin (AACT) genes (centromere to telomere). 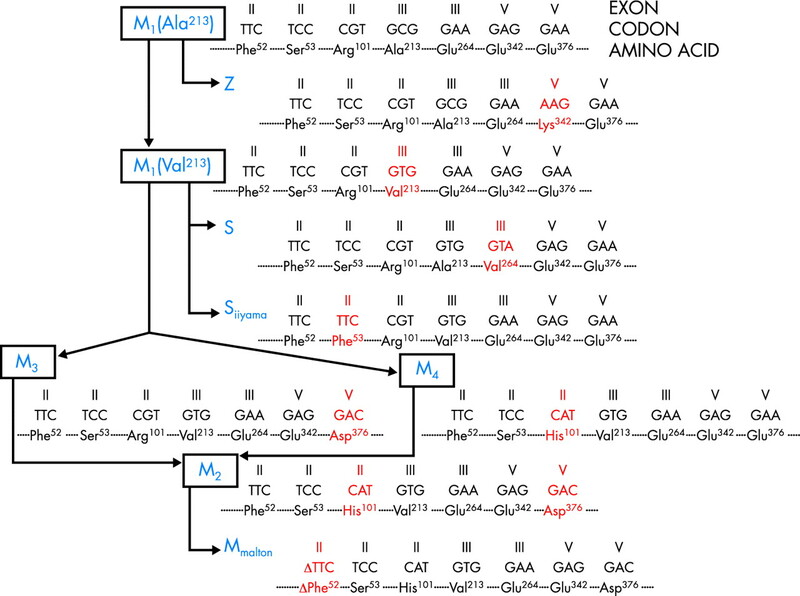 The AAT gene spans 12.2 kb in length and has three non-coding (IA, IB, IC) and four coding (II, III, IV, V) exons; exon V contains the sequence coding for the reactive site of the AAT protein (Met358–Ser359). There is a close genetic linkage between the AAT and AACT genes, and it is likely that the two loci differentiated relatively recently (100–250 million years ago).10 Only a few nucleotide differences have been detected between AAT in higher primates (baboons, gorillas, and chimpanzees) and the human AAT ancestral variant, all displaying the Arg101-Ala213-Glu376 combination.11 Based on substitutions of these three major amino acids as haplotype markers, it has been possible to draw a likely phylogenetic tree of the major normal AAT variants and of the most frequently detected deficient variants (fig 1). The surveys include a wide variety of subjects: blood donors, neonates, pregnant women, various groups of workers, students, and subjects submitted to parentage tests, laboratory or hospital staff, or “randomly” selected individuals. In many instances no details about selection criteria are available. The survey sample sizes vary from a few dozen to several thousands of subjects, with a high percentage of surveys including 100–500 subjects. Gene frequency estimates from cohorts of fewer than 200 individuals have a high risk of error. In most of the studies the AAT variants were determined by IEF (also referred to as “phenotyping”), although crossed immunoelectrophoresis was used in many of the older surveys published before the 1980s. The two methods are not completely interchangeable.5 To date, no genetic epidemiology surveys on AAT deficiency using molecular methods (“genotyping”) have been reported. Given these differences, some degree of bias may have been introduced into the global analysis of the surveys. The prevalence of the three major AAT variants (PI*M, PI*Z, and PI*S) is reported in most surveys as gene frequencies—that is, the frequency of a variant in homozygotes (where the variant contributes two alleles) or in heterozygotes (where the variant contributes one allele), and quoted as 0.0 ... n (or n per 1000 individuals). A step beyond is to use gene frequencies with the Hardy-Weinberg equilibrium formula to estimate the total number of carriers (PI*MS and PI*MZ) and subjects with deficiency variant combinations (PI*SS, PI*SZ, and PI*ZZ). This approach was used by de Serres13 to estimate the population at risk (carriers + subjects with deficiency variants) in a given country or geographical region, taking into account the overall population. The distribution of PI*S differs markedly from that of PI*Z and is more homogeneous.24 The highest frequency of PI*S is in southern Europe (mean gene frequency 0.0564),13 peaking in the Iberian peninsula (gene frequency >0.1400).25,26 The distribution of PI*S gradually decreases along a south-west → north-east gradient. The distributions of both PI*Z and PI*S in Europe are summarised in fig 2. Frequencies of (A) PI*S and (B) PI*Z genes in Europe. The mean ratios of PI*S:PI*Z are 4.5:1 in southern Europe, 3.5:1 in western Europe, and 1.1:1 in northern Europe (calculated from de Serres et al13). Analysis of 40 cohorts from Italy (reviewed by de Serres et al29) showed that the gene frequencies of PI*S and PI*Z are highest in northern Italy and decrease gradually from north to south. In one of the few available population based surveys performed in 9000 neonates in South Tyrol, a comparison between German and Italian individuals yielded a PI*Z gene frequency of 0.019 and 0.015, respectively.30 In Sardinians the gene frequency of PI*S is higher than in continental Italy whereas that of PI*Z is much lower. The gene frequencies of PI*Z and PI*S in Australia and New Zealand are very close to those reported for North America (0.0151 and 0.0395, respectively), probably for the same reasons. Very limited cohorts have been reported from Japan, China, and South Korea.13 The gene frequency of PI*Z is 0.0002 in Japan, 0 in China, and 0.0061 in South Korea, whereas the respective figures for PI*S are 0.0004, 0.0006, and 0.0070. Interestingly, the AAT M1 (Ala213) variant, found in approximately 20–23% of AAT deficient white subjects,11 was not detected in any of 156 Japanese subjects. Since the Z variant has developed on the M1 (Ala213) base allele (fig 1), this may account for the extreme rarity of the PI*Z gene in the Japanese and other Far Eastern populations. These findings also account for the prevalence of the Siiyama deficiency variant in the Japanese; this variant arose on the M1 (Val 213) base allele (fig 1)36,37 and was present in 100% of the 156 Japanese investigated. The belief that AAT deficiency is a disorder which mostly affects white subjects has been, in part, shaken by the analysis of the worldwide surveys performed by de Serres.13 He provided evidence for a significant prevalence of both PI*Z and PI*S in populations from the Middle East and North Africa, Central and Southern Africa, and Central and South-East Asia, suggesting that AAT deficiency has prevailed over racial and ethnic boundaries. The analysis of allelic variants within the serpin gene cluster in defined populations may yield useful information about the time and site of origin of AAT deficient variants. In an investigation of white PI*Z families of northern European origin, Byth and coworkers38 found that 97% of cases had a unique haplotype of 60 kB encompassing the CBG, PIL, and AAT genes associated with the PI*Z allele, thus supporting the theory of a single origin for the PI*Z mutation.39 Haplotype analysis also allows an estimate of the time the PI*Z mutation first occurred. Based on the assumption of random recombination in a given area, Byth hypothesised that the PI*Z mutation might have arisen 66 generations ago—that is, assuming 33 years to be the mean lag for each generation, ~2000 years ago. This estimate differs from a previous hypothesis of 216 generations (~7000 years ago39) and a more recently advanced estimate of 120 generations (~4000 years ago40). Interestingly, according to the last estimate, the PI*Z mutation could have been dispersed during the Neolithic era, as has been suggested for the cystic fibrosis ΔF508 mutation.40,41 According to the hypothesis that the higher the gene frequency in a given country, the more likely it is that the gene first occurred there,12 it is commonly accepted that the PI*Z gene arose in northern Europe (and maybe more precisely in southern Scandinavia) and subsequently spread to other European countries and to countries bordering the Mediterranean Sea, following the known major population movements in Europe such as the Viking voyages. Nevertheless, the facts that patterns of haplotype diversity contrast with the expected stepwise reduction if the mutation spread from north to south, as demonstrated in populations from the Iberian peninsula,40 and that PI*Z types are found in populations from Central and South Africa and from Asia,13 suggest a diffusion against the main known directions of population movements or, alternatively, a multiregional origin for the PI*Z gene. The finding that the prevalence of PI*S is highest in the Iberian peninsula indicates that the PI*S gene probably originated in this area, and perhaps more precisely in the Portuguese population.40 Interestingly, serpin haplotype investigation in this population suggests that this event occurred 15 000–10 000 years (450–300 generations) ago, making the PI*S mutation much older than the PI*Z one. At variance with the European spread of PI*Z, the west to east gradient of PI*S mutation indicates a diffusion against the known major population movements in Europe. Taking into account the gene frequencies of PI*S and PI*Z reported in the genetic epidemiology surveys retrieved from the international literature and the number of individuals in the total populations in different countries, de Serres13 calculated worldwide estimates of subjects affected by intermediate AAT deficiency (that is, carriers) and of subjects at high risk of developing lung/liver disease associated with AAT deficiency (that is, PI*Z homozygotes and PI*SZ compound heterozygotes). Of course, such an approach incorporates potential biases: in addition to the above reported limitations of the studies considered, some investigations were performed in selected populations which were poorly representative of the general population.29 As an example, the cohorts examined for Italy included a number from the valleys on the south side of the Alps30 (where geological barriers are evident, separating these cohorts from those recruited among inhabitants of the nearby plains), and from Sardinia (whose genetic isolation has been already discussed33). These results should therefore be considered with caution. Despite these caveats, the overall estimates of approximately 116 000 000 carriers and 1 100 000 subjects with severe AAT deficiency worldwide are astonishing and indicate that AAT deficiency is probably one of the most common severe hereditary disorders in the world (table 1). Taking into account the above mentioned estimates, it is evident—not only to physicians actively involved in the diagnosis and management of AAT deficiency—that this is a largely under-recognised condition. The availability of AAT replacement therapy for individuals with pulmonary emphysema associated with AAT deficiency42 encouraged the scientific community to establish and reinforce AAT deficiency screening programmes in developed countries, even in those not previously considered to have a high prevalence of the disorder, and to implement national registries.43 In response to a suggestion forwarded during a WHO meeting on AAT deficiency,34 an international registry confederating national registries from several countries was established in 1996.44,45 In spite of the extensive efforts made to identify cases with AAT deficiency, it is clear that only a small minority of subjects are actually recognised (table 2). There are at least two reasons for this under-recognition. Firstly, the clinical phenotypes associated with AAT deficiency (pulmonary emphysema, chronic bronchitis, bronchiectasis, asthma and, to a lesser extent, chronic liver disease) are not exclusive to the condition. Even familial aggregation of the phenotype, a typical feature of inherited disorders, is not a useful sign since common chronic obstructive pulmonary disease often tends to cluster in families.46 Secondly, the PI*Z gene is characterised by an incomplete penetrance—that is, the relationship between genotype and clinical phenotype is not strong. Silverman and coworkers examined pulmonary function in a cohort of 52 PI*Z subjects: 20 out of the 52 subjects (38%) had a forced expiratory volume in 1 second (FEV1) over 65% predicted and frequently within the normal range.47 These PI*Z subjects with normal or only mildly impaired lung function are usually identified as non-index cases—that is, cases ascertained during family screening. The same authors also found that the severity of the disease manifestations is affected by some variables such as cigarette smoking and lower respiratory tract infections (gene × environment interaction). The percentage of subjects with asymptomatic or mild AAT deficiency was even higher among a series of 94 individuals with PI*SZ compound heterozygosity.48 In conclusion, there is evidence that many individuals with severe AAT deficiency do not have clinically significant lung function impairment. This feature of AAT deficiency deserves further investigation, both from the epidemiological and genetic viewpoints. Little is known about the genetic epidemiology of rare AAT deficient variants which are considered not to exceed 2–4% of all variants.49 However, the prevalence of these variants may be higher than was previously believed because rare AAT deficient variants can be mistaken for the PI*Z variant and therefore misdiagnosed. Indeed, we have preliminary data from the Italian Registry for AAT Deficiency to indicate that as many as 22% of the total AAT deficient variants are rare.50 The nomenclature of some of these variants (see above) reflects their probable Italian origin (Mprocida, Mpalermo, QOisola di procida, QOtrastevere).5 An intriguing question is: are the rare AAT deficient variants more frequent in those countries in which the gene frequency of PiZ is lower? Data from the island of Sardinia seem to support this hypothesis.51 Clinical phenotypes associated with the common AAT deficient variant PI*Z are reasonably well defined, as will be discussed later in this review series, but no information is so far available on clinical phenotypes associated with rare AAT deficient variants. This should be addressed by future studies. The authors are grateful to Drs Jordan Baccheschi, Ilaria Ferrarotti, and Michele Zorzetto for their help in preparing this manuscript, and to Dr Rachel Stenner for editing it. Laurell CB, Eriksson S. The electrophoretic alpha1-globulin pattern of serum in alpha1-antitrypsin deficiency. Scand J Clin Lab Invest1963;15:132–40. Travis J, Salvesen GS. Human plasma proteinase inhibitors. Annu Rev Biochem1983;52:655–709. Carrell RW, Lomas DA. Alpha1-antitrypsin deficiency. N Engl J Med2002;346:45–53. American Thoracic Society/European Respiratory Society Statement. Standards for the diagnosis and management of individuals with alpha1-antitrypsin deficiency. Am J Respir Crit Care Med2003;168:818–900. Brantly M. Alpha1-antitrypsin genotypes and phenotypes. In: Crystal RG, ed. Alpha1-antitrypsin deficiency. New York: Marcel Dekker, 1996:45–59. Fagerhol MK, Laurell CB. The Pi system-inherited variants of serum alpha1-antitrypsin. Prog Med Genet1970;96:96–111. Eriksson S. A 30-year perspective on α1-antitrypsin deficiency. Chest1996;110:237–42. Cox DW, Nakamura Y, Gedde DTJ. Report of the committee on the genetic constitution of chromosome 14. Cytogenet Cell Genet1990;55:183–8. Kurachi K, Chandra T, Degen SJF, et al. Cloning and sequence of cDNA coding for alpha-antitrypsin. Proc Natl Aca Sci USA1981;78:6826–30. Bao J-J, Sifers RN, JV, et al. Molecular evolution of serpins: homologous structure of the human α1-antichymotrypsin and 1-antitrypsin genes. Biochemistry1987;26:7755–9. Nukiwa T, Ogushi F, Crystal RG. Alpha1-antitrypsin gene evolution. In: Crystal RG, ed. Alpha1-antitrypsin deficiency. New York: Marcel Dekker, 1996:33–43. Hutchison DCS. α1-antitrypsin deficiency in Europe: geographical distribution of Pi types S and Z. Respir Med1998;92:367–77. de Serres FJ. Worldwide racial and ethnic distribution of α1-antitrypsin deficiency. Summary of an analysis of published genetic epidemiology surveys. Chest2002;122:1818–29. Fagerhol MK. Serum Pi types in Norwegians. Acta Pathol Microbiol Scand1967;70:421–8. Hjalmarsson K. Distribution of alpha1-antitrypsin phenotypes in Sweden. Hum Hered1988;38:37–30. Arnaud P, Koistien JM, Wilson GB, et al. Alpha-1-antitrypsin (Pi) phenotypes in a Finnish population. Scand J Clin Lab Invest1977;37:339–43. Thymann M. Distribution of alpha-1-antitrypsin (Pi) phenotypes in Denmark determined by separator isoelectric focusing in agarose gel. Hum Hered1986;36:19–23. Hoffmann JJ, van den Broek WG. Distribution of alpha-1-antitrypsin phenotypes in two Dutch population groups. Hum Genet1976;32:43–8. Arnaud P, Galbraith RM, Faulk WP, et al. Pi phenotypes of alpha-1-antitrypsin in Southern England: identification of M subtypes and implications for genetic studies. Clin Genet1979;15:406–10. Sesboue R, Charlionet R, Vercaigne D, et al. Genetic variants of serum alpha-1-antitrypsin (Pi types) in Bretons. Hum Hered1978;28:280–4. Sveger T. Liver disease in alpha1-antitrypsin deficiency detected by screening of 200,000 infants. N Engl J Med1976;294:1316–21. Sveger T, Mazodier P. Alpha1-antitrypsin screening of 18-year-old men. Thorax1979;34:397–400. Dahl M, Tybjaerg-Hansen A, Lange P, et al. Change in lung function and morbidity from chronic obstructive pulmonary disease in alpha1-antitrypsin MZ heterozygotes: a longitudinal study of the general population. Ann Intern Med2002;136:270–9. Blanco I, Fèrnandez E, Bustillo EF. 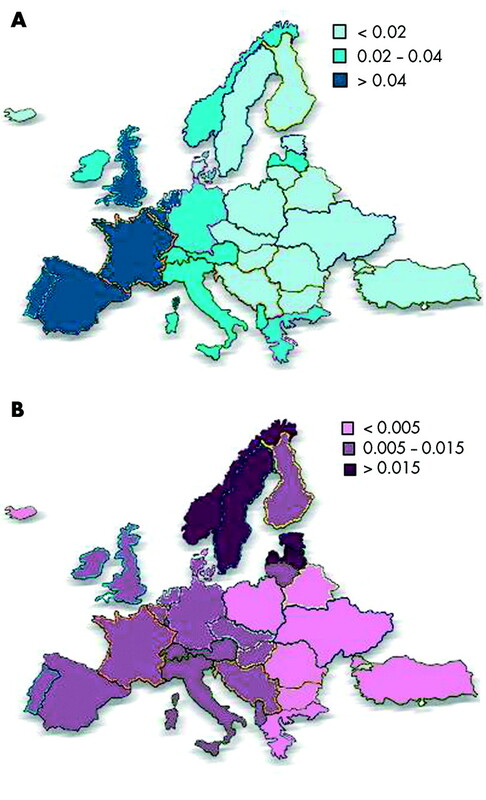 Alpha-1-antitrypsin PI phenotypes S and Z in Europe: an analysis of the published surveys. Clin Genet2001;60:31–41. Carracedo A, Concheiro L. Distribution of the Pi, TfC, and Gc subtypes in Galicia (North West Spain). Z Rechtsmed1983;90:153–8. Martin JP, Sesboue R, Charlionet R, et al. Genetic variants of serum alpha-1-antitrypsin (Pi types) in Portuguese. Hum Hered1976;26:310–4. Beckman G, Beckman L, Nordeson I. Alpha-1-antitrypsin phenotypes in Northern Sweden. Hum Hered1980;30:129–35. Fagerhol MK, Eriksson AW, Monn E. Serum Pi types in some Lappish and Finnish populations. Hum Hered1969;19:360–4. de Serres FJ, Blanco I, Fernàndez-Bustillo E. Genetic epidemiology of alpha-1 antitrypsin in southern Europe: France, Italy, Portugal and Spain. Clin Genet2003;63:490–509. Pittschieler K, Massi G. Alpha 1 antitrypsin phenotypes in two population groups in north Italy. Padiatr Padol1988;23:307–11. Estefania FJ, Carracedo AM, de Pancorbo M, et al. Alpha-1-antitrypsin (Pi) subtypes in the Spanish Basque provinces. Hum Hered1987;37:233–6. Garcia-Orad A, Aritzi P, Esteban JL, et al. Polymorphism of haptoglobulin (HP), group specific component (CG) and alpha-1-antitrypsin (PI) in the resident population of the Basque Country (Spain). Gene Geogr1990;4:43–51. Imanishi T, Wakisaka A, Gojobori T. Genetic relationship among various human populations indicated by MHC polymorphisms. In: Tsuji K, Aizawa M, Sasazuki T, eds. HLA 1991. Proceedings of the 11th International Histocompatibility Workshop and Conference. Oxford: Oxford Science Publications, 1992;1:627–39. Anon. α1-antitrypsin deficiency: memorandum from a WHO meeting. Bull WHO1997;75:397–415. Silverman EK, Miletich JP, Pierce JA, et al. Alpha1-antitrypsin deficiency. High prevalence in the St Louis area determined by direct population screening. Am Rev Respir Dis1989;140:961–6. Nukiwa T, Seymana K, Kira S. The prevalence of α 1AT deficiency outside the United States and Europe. In: Crystal RG, ed. Alpha1-antitrypsin deficiency. New York: Marcel Dekker, 1996:293–301. Seymana K, Nukiwa T, Takabe K, et al. Siiyama (serine 53 (TCC) to phenylalanine (TTC)): a new α1-antitrypsin deficient variant with mutation of a predicted conserved residue of the serpin backbone. J Biol Chem1991;266:12627–32. Byth BC, Billingsley GD, Cox DW. Physical and genetic mapping of the serpin gene cluster at 14q32.1: allelic association and a unique haplotype associated with α1-antiyrpsin deficiency. Am J Hum Genet1994;55:126–33. Cox DW, Woo SLC, Mansfield T. DNA restriction fragment associated with α1-antitrypsin indicate a single origin for the deficiency allele PIZ. Nature1985;316:79–81. Seixas S, Garcia O, Trovoada MJ, et al. Patterns of haplotype diversity within the serpin gene cluster at 14q32.1: insights into the natural history of the α1-antitrypsin polymorphism. Hum Genet2001;108:20–30. Serre JL, Simon-Bouy B, Mornet E, et al. Studies of RFLP closely linked to the cystic fibrosis locus throughout Europe lead to new considerations in populations genetics. Hum Genet1990;84:449–54. American Thoracic Society. Guidelines for the approach to the patient with severe hereditary alpha-1-antitrypsin deficiency. Am Rev Respir Dis1989;140:1494–7. Miravitlles M, Vidal R, Barros-Tizòn JC, et al. Usefulness of a national registry of alpha-1-antitrypsin deficiency. The Spanish experience. Respir Med1998;92:1181–7. Luisetti M. Introduction: the history of the Alpha One International Registry (AIR). Respir Med2000;94 (Suppl C) :1–2. Luisetti M, Miravitlles M, Stockley RA. Alpha1-antitrypsin deficiency: a report from the 2nd meeting of the Alpha One International Registry, Rapallo (Genoa, Italy), 2001. Eur Respir J2002;20:1050–6. McCloskey SC, Patel BD, Hinchliffe SJ. Siblings of patients with severe chronic obstructive pulmonary disease have a significant risk of airflow obstruction. Am J Respir Crit Care Med2001;164:1419–24. Silverman EK, Pierce JA, Province MA. Variability of pulmonary function in alpha-1-antitrypsin deficiency: clinical correlates. Ann Intern Med1989;111:982–91. Seersholm N, Kok-Jensen A. Intermediate α1-antitrypsin deficiency PiSZ: a risk factor for pulmonary emphysema? Respir Med1998;92:241–5. Zorzetto M, Tamburnotti C, Maschietto B, et al. A fast amplification-reverse hybridization assay kit to detect the most frequent deficient variants in the alpha-1-antitrypsin gene. Respiration2002;69:81–5. Luisetti M. The Italian Registry for AATD. Epidemiology of rare AATD variants. Alpha 1 Foundation 4th International Scientific Conference: Epidemiological Aspects of Alpha-1-Antitrypsin Deficiency, Charleston SC, 2002:19. Sergi C, Consalez GG, Faretti G, et al. Immunohistochemical and genetic characterization of Mcagliari alpha 1 antitrypsin molecule. Lab Invest1994;70:130–3. In part supported by IRCCS Policlinico San Matteo Ricerca Corrente Grants, Italian MIUR Progetti di Interesse Nazionale 2002, Fondazione Cariplo, Bayer EU, and Altana Pharma.